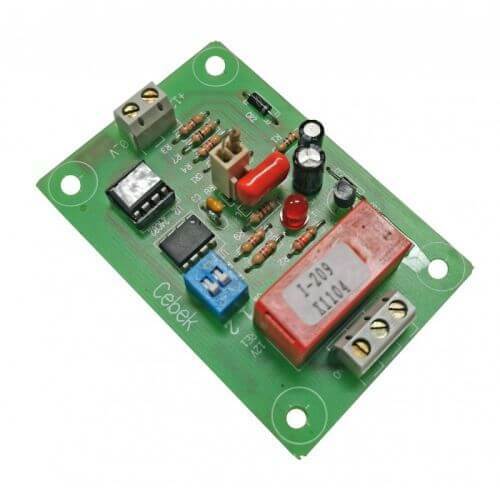 Extra-long duration 1, 2, 3 or 6 month timer board module with mains rated relay output. The required number of months is easily set using onboard switches. A simple electronic "key" is used to start the timer (one is supplied, not two as indicated in the User Manual). The relay activates for 2 seconds to indicate the timer has been set and then it turns off (so you connect your equipment to the normally closed relay output). The operation has been designed in this way to minimise the current draw during the timing period to under 13mA. The relay turns on when the preset time has elapsed. The electronic "key" is then required to start a fresh timing cycle. An LED gives visual indication of the timing status. The timer must be connected to a permanent 12Vdc power supply. Includes protection against inverse polarity and a screw terminal block for connections. Ideal for rental properties, equipment rental, holiday homes, games, etc.